“My whole thing is staying organized.” Mike Barugel launched FYT Virtual Assistants to help you. From creating spreadsheets during play as a child to making processes at his first job at McDonald’s, Mike has always had a talent for putting tasks in order. His own career path has not always felt orderly though. Mike shares how and why he got to the point of launching a virtual assistant agency. 00:00 Mike Barugel: But at that point I sort of had a little bit of a very early, let’s say a quarter-life crisis, [chuckle] where I was like, Wait a second, I don’t like this at all. And is this where my life is going? 00:11 Announcer: This is Do Good, Be Good. The show about helpful people and the challenges they face in trying to do good. Your host is Sharon Tewksbury-bloom, a career do-gooder, who also loves craft beer and a good hard tackle in rugby. Sharon speaks to everyday people about why they do good and what it means to be good. 00:31 Sharon Tewksbury-bloom: Greetings. I’m your host, Sharon Tewksbury-bloom. I’m so excited to share this episode with you. Today’s guest is Mike Barugel. 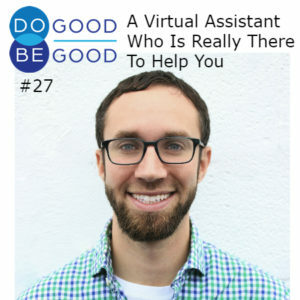 I have come to know Mike over the last few months, because I hired his company FYT Virtual Assistants to help me get this podcast out to you all, as well as a few other things. He and his team have been amazing. I was really interested in hearing how Mike got started in this virtual assistant business, so I invited him onto the show. In this episode, we hear about how Mike got started and how he thinks about meaningful work. 01:08 ST: So this season is about meaningful work. And one thing that I’ve been asking everybody is; what was your first job? 01:18 MB: Wow, very first job. I was a cashier at Gill McDonald’s at 15 years old, and I remember taking that job because it was one of the few places in New Jersey, where I grew up, that you could actually start working at 15 not 16. 01:36 ST: Was there any moment in that job where you felt like you were being helpful or doing good? 02:20 ST: Nice. Was there anything that led you to choose another path for what type of work you were looking for after that? 02:29 MB: I think the learning was more so like what types of things I liked to do. I think I always knew I was a pretty organized and structured person, but having applied that to work, I realized that I really thrived at anything that was formulaic or methodical, anything that had a pretty straightforward process, and in fact, if it didn’t, I sort of made one up, [chuckle] to make sure that I was checking things off of a list. So I remember just going over the sweeping and mopping procedure, and it’s like, “Okay,” but I remember asking, “But what’s the order? Do you sweep first or do you mop first, what makes more sense?” And I needed to know the answer. Luckily, I’ve lightened up a little bit over the years, [chuckle] but it’s funny that that definitely carries through in almost everything that I do. It’s just I like to figure out the process and then do it and execute it, and then get it done. It’s sort of a feel good thing. 03:41 ST: Is there any fun family story or something people love to tell that defines that part of your personality? 03:48 MB: Maybe my parents are going around telling people these stories, I don’t really know. [chuckle] but there’s one that sticks out. I remember growing up, probably 10, 12 years old, somewhere in there, and wanting to play shop. So I would make my room into this little store, and I would price everything out and put little notes on how much things would cost. And I remember my dad, this was back when computers were just starting to become very popular. So I remember opening some sort of spreadsheet application, and typing in the name of the product and how much it cost. And it’s crazy how doing bookkeeping now. But yeah, it’s funny how those types of things definitely were present early in life and kind of stuck with me and went along. 04:39 ST: Then once you actually more formally got on a path towards some sort of career, what did that look like in terms of your high school guidance counselor, whatever you told people you wanted to be when you grew up, how did you get started in the career world? Was it ever kind of clear that this work you were doing, you felt like you had a bigger purpose or it was meaningful or how did you navigate that? Was that important to you at the time? 05:09 MB: Yeah. That’s a great question. I mean, I think that to be totally honest, at the time when I was in college and doing these internships and I did have several with Chase, I realized that I was more about the people than anything. I just like… And I mean the fellow interns, we were lucky to have a class of anywhere from 40 to 60 interns each summer, that were going through this internship program. We all worked in different departments throughout the whole company, but there were a lot of events that we did together. And I’m sort of naturally the social organizer in a lot of aspects, in groups in my life. And so I would invite all the people over to my house every Thursday night to have some drinks and hang out. And I realized that that’s more of who I was than anything. I didn’t really connect with the work as much as I did with the people. 06:05 MB: And so, sort of fast forward, right after I graduated college, I ended up taking a job with an accounting firm in Philadelphia. And I very quickly learned that that was not the right decision for me and it was not the right path for me, although I did last almost two years. But at that point I sort of had a little bit of a very early, let’s say a quarter-life crisis, [chuckle] where I was like, “Wait a second, I don’t like this at all. And is this where my life is going?” I sort of had this really critical moment. And I did a lot of reflection at that point and it was really only a year after I graduated college, and I realized that I did want more meaningful work. I did wanna do something that I actually felt connected to and felt passionate about. And I realized that one of the values that I really had was to be able to help others directly, to make a direct impact on other people. 07:00 MB: And then I sort of did a little bit more reflection and realized I really had this neck for working with college-age students and had a real passion for helping people avoid making the career decisions that maybe weren’t the best for them based on some personal experience. So that’s actually when I decided to go back to school and get a master’s degree to be a career counselor. I think all of these stages were necessary, and I eventually got to realizing what a core passion of mine was, which was to help others kind of navigate through their career as a college student. 07:33 ST: Nice. Alright, I’m gonna bring you back, I’m gonna pause you and bring it back to that moment, ’cause you’ve said that there was that moment in the accounting firm when you were having that quarter-life crisis. So, let’s just dig into that, go back there in your mind for a second and think about what did it look like or feel like or was there a particular turning point or a moment or something you observed that you were like, “Oh my gosh, how is this my life or is this gonna be what every day is like.” [chuckle] Take me back there. I’m sorry to make you relive it, but was is it like? 08:11 MB: That’s okay, it’s still very vivid. About almost ten years later. There were many critical points but there was one moment actually that I was very inspired. I was traveling, I was living in Philadelphia, but I was traveling to and from Boston for a particular project, literally every single week for almost six months, and it was one of those things where it was, “Okay. It’s gonna be a month, oh, wait, it’s gonna be two months.” Then they just kept prolonging it and extending it. And these… For budgetary reasons we were taking trains not planes to get there, which made it even worse, but it gave me a lot of time for reflection. And so within the first six months of being a working professional, going back and forth on this train, I already started to feel like, Man, this is really taxing, like, “The hours are long. I really don’t love the people I’m around every day,” both the clients and my managers who I’m working with. I just really started acknowledging like, “This is not fun, this is not what I want life to be like.” Honestly, it felt crushing, it felt like this was going to be real life, it felt like fun was over at 21 and now from 22 ’till I die, it was just gonna be miserable. And that’s not the case, thankfully, I realize now. But then it felt like that. 09:39 MB: And so I remember taking the train, Sunday evenings or Monday mornings there, and then Friday afternoons back, and doing a lot of writing and just thinking and stuff like that. And I’ll never forget, one weekend on the way back from Boston, I decided intentionally to sit in the quiet car which they have on most Amtraks, and I really just wanted to rest, close my eyes and not talk to anybody. And of course I get in the quiet car and I sit down. And this guy just starts chatting me up and we’re talking, and I’m nervous because I’m making too much noise in the quiet car, but he’s clearly trying to talk to me and I’m trying to be as quiet as possible, anyway, long story short, he is the cousin of a kid that I went to elementary school with for eight years, and so we knew somebody in common. He happened to be a doctor, very well read, and I sort of… Actually I didn’t even really share too much before he noticed that I was really struggling. 10:44 MB: And he just kind of talked with me a bit and tried to understand what was going on and then recommended a book called “The Four Agreements” which I ended up buying and reading in one sitting, on a train back to Boston the next week. And that book and his lending a hand or lending an arm out to reach out to me, both combined to really inspire me to say, “You know what, if I don’t like this right now, then I can do something different. Just because I took this job doesn’t mean I have to do it forever or even for another year if I really don’t want to.” So that was the moment that really kicked me into gear, it still was about another year and a half before I started grad school but the process had already been starting to go into motion. 11:38 ST: And once you were in the career counseling field, was there a moment where it felt like, “Yes, this is what I was hoping for from this career path. This was worth leaving, this was worth going to grad school, everything.””? 12:37 ST: I hope you are enjoying Mike’s story. To support this show, please consider buying a Do Good Be Good shirt or sweatshirt. They are on sale now. You can find out more at our website dogoodbegoodshow.com or at the Facebook page, facebook.com/dogoodbegoodshow. What else would really help is if you could rate and review our show in whatever podcast app you are using, whether that’s Apple podcast Stitcher, Google Music, when you rate and review the show, it really helps other people find it. Thank you so much for your help. Now back to our conversation. 13:18 ST: We talked about when you got into career counseling having a moment where you were like, “Yes, this shows that this was a good path or that this is a good day on the job here,” so how does… Do you have an example of maybe a day in starting the company that you were like, “Yes, this is definitely what I wanna do or it’s working or I’m clearly helping people or jelling in some way.”? 13:44 MB: There are many, there are many. And I think that’s what’s great about having your own business, too, is you can kind of really focus on the things that you want to. Of course, there’s always gonna be the back office type of stuff and things that you need to keep the business moving. But yeah, I think that’s one of the things to be honest with you, I’m still trying to find the groove for the business of who is our ideal market and what is our niche and all that. I mean I can be totally transparent to say that’s still evolving, and it probably always will. But finding clients that are a good fit. I think you and I have had a good relationship so far, which has been great. 14:29 MB: I’ve had a few clients that didn’t feel like a good fit, but some… And actually, I would say the majority have. And so finding that groove with the client to figure out, “Okay, how do we best work together? How do we best keep each other in communication about what needs to get done?” And then going back to the McDonald’s days of making a process, and then checking it off, that’s what I love. I love having something listed out and then knowing that it’s gonna get done on our end, and relieving that from the client so that they don’t have to worry as much. And knowing that it’s gonna get done. And of course, getting feedback is always a great thing but I think a lot of it is just feeling good about the work that we’re doing too. 15:13 ST: On that kind of theme about wanting to always be helpful to your clients, how do you think about in your business in terms of what your business is there to do, it’s purpose, the way that it makes the world better in its own little sphere of influence? [chuckle] yeah. What is your goal to try to make your little part of the world better? 15:37 MB: Yeah. I was just talking about this mentor program and my mentors and in the first meeting, my biggest takeaway was ask them challenging me to really think about the why. Why are you doing this? And it’s crazy. I actually had lost sight of that because I was just so super-focused on getting it done that I didn’t really remember why I was doing it. And it was kind of disheartening and also eye opening at the same time. And since then I’ve refocused that in my head and realized my whole thing is staying organized. That’s what I was doing, playing shop at 10 years old, that’s what I was doing in probably every job I’ve had, is; How do we make things as organized and efficient as possible? 16:28 MB: And I love personally helping people with that. Obviously, I’ve built a business around that as well. And so, any ways that we can help our clients feel more organized, and truly become more organized, I think is a huge win for us. And it’s something that I’m realizing more and more that people need. And of course, there are many, many different ways to market that and to figure out who might need it, but there are a lot of people who do, and a lot of people who probably don’t need to be spending their time doing that, organizing piece, whether it’s using technology or just cleaning up files or whatever it might be. So, yes, that’s where the passion lies. 17:24 MB: Right, yeah, which I love. 17:33 MB: Right. [chuckle] You need to get up. 17:34 ST: Where I set up some systems and some processes and the technology tools to support them, so that even if it does take a little work upfront to get it all sorted out, it will just keep getting more streamlined and simpler and I can do more. 17:50 MB: Yeah, exactly, and I love that way of looking at that perspective of the future me ’cause I think it helps bring it to life and say, “Hey, down the road, six months from now or whenever, how am I going to interact with whatever this is? Is it going to make sense if we leave it today, and pick it back up then? That’s a really helpful way of looking at how to organize. 18:16 ST: Well, my final question that I’ve been collecting from everyone is the name of the show is Do good, be good. So what does it mean to you to be good? 18:26 MB: I think I’ll bring back in the Four Agreements book that I had talked about that gentleman had recommended to me. And the four agreements are all great, but I really think that piece of, always do your best really does resonate with me. We’re not always going to succeed in doing our best, but I think if we’re always trying to do our best, that makes a really positive impact on the world. And I’m a big fan of the idea of make little drops in the pond, even though you don’t think that that might do anything, that ripple effect does really happen. And so even if it’s just holding the door open for that person or saying one nice thing to somebody that you know per day, or whatever it might be, that really does go a long way. 19:19 ST: Awesome. I love hearing from passionate and thoughtful people like Mike. I am so grateful to have found him to help me with my business. Thank you, Mike, for coming on the show and sharing your story. Next week our guest is Jamie Hasapis. Jamie is a music teacher in Flagstaff and has great stories and insights to share, based on his winding career path that led him to where he is today. You won’t wanna miss it, so make sure you subscribe to this podcast. You can subscribe in Apple Podcast, Stitcher, Google Music or any other podcast app. If you can’t find it, please, let me know. Email me at connect@sharanspeaks.com. 20:02 MB: Thanks as always to our hosts, Sun Sounds of Arizona, and a big shout out to my editor, Bob Larkin. Music in this episode, ‘Bathed in fine dust’ by Andy G. Cohen released under Creative Commons Attribution international license and discovered in the free music archive. Until next week, this is Sharon Tewksbury-bloom, signing off.